Spotted Saddle Horse Breeders and Stallions Directory - O Horse! Registered Tennessee Walking Horses. Rising Star Ventures offers some of the finest in Tennessee Walking and Spotted Saddle Horses. We are located in southern California between Hemet and Temecula. 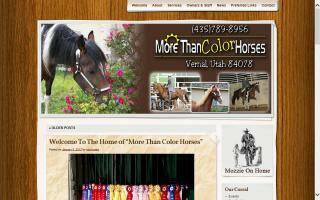 We specialize in BIG, even tempered horses with smooth gaits and the added bonus of spectacular colors! We currently (as of Apr 2010) have several double dilute mares (cremellos & perlinos) and two gorgeous tobiano spotted stallions! Our horses are not just 'go around in a circle' show ring horses. They are extensively ridden on the trail and compete in Competitive Trail Rides as well. Disposition is of utmost importance to us, as is a smooth gait. We do not believe in unnatural training devices or methods, and all of our horses are 100% natural gaited with a natural and normal hoof length on them. NO pads or chains! We welcome visitors any time by appointment. We love to show off our wonderful horses! Established in 1998, The JBiT Ranch, LLC provides both full care and field board for your horse in a friendly, family environment. With access to hundreds of miles of trails on our 128 acres, our apple orchard, stream, rolling hills, and surrounding areas, you can ride to your heart's content! We offer two state of the art indoor arenas, a John Lyon's round pen, 14 stalls, wash and grooming stalls, and field board! Experienced trainer/owners live on the premises and provide care 24/7. We specialize in Western and natural horsemanship training and riding methods as well as gaited horses. We offer both English and western riding lessons and training and welcome all disciplines. Rockin Bar W Ranch is a small size Tennessee Walking Horse / Spotted Saddle Horse breeding farm located in Camden, Ohio. We are in Preble County just north of Cincinnati and south of Dayton. We specialize in producing show quality TWHBEA and SSHBEA horses. Arkansas Foxtrotters, located in Garland County in central Arkansas, is a breeding and sales facility, primarily for Fox Trotting Horses. We strive for conformation, color, good temperaments, versatility, and natural Fox Trot ability in our breeding program. Buckskins, palominos, and dilutes. Check out our website for new arrivals.